The Barcelona chair cushions are made of leather. The original was made from pig skin, but we use only 100% imported high quality Italian leather for all of releases. Contemporary manufacturers have explored the length and breath of possibility in this regard, producing Barcelona style chairs of every conceivable type of leather – some with notably striking results. Leather is a versatile and surprisingly diverse material. Leathers can vary tremendously: Consider that a raw hide can be thin or thick, supple or brittle; it can be scared or clean grained. Grain might be regular or irregular, deep or barely visible. And all of this variation exists even before the hide has been treated, scraped, dyed, printed, coated, cut and sewn. The characteristics of the leather upholstery on your Barcelona Chair will to large degree define the apparent quality of the whole item. In selecting leather an expert would look several characteristics. A soft and supple ‘hand’: A technical term which really just means – how good it feels on your hand; and a texture that they like. However texture is really quite a subjective and therefore personal choice. Top grain leather refers to the epidermis of a hide. That top layer that is both the strongest, most durable and the most characteristic. To be used as top grain leather, hides must have a pleasing regularity of appearance, without too many scars. All high quality manufacturers of leather upholstery will use top grain leather. Corrected leather or Embossed leather has been stamped to apply an even texture, simulating the grain of leather, but without the naturally uneven markings of uncorrected leathers (removes wrinkles, bites and scars). This allows leathers with too many markings to be corrected, making them more appealing , and also addresses a growing market for uniformity and consistency. Corrected leathers are often but not always lower in price than uncorrected leathers. Pigmented leathers are aniline dyed hides that includes a pigmented topcoat. The topcoat increases the leather’s durability and color consistency, but also increases the stiffness very slightly. People who like their leather furniture uniform and perfect as well as people who want more protection will enjoy this type of leather. Some prefer more durable leather, one with a pigment and clear protecting coating. These can be almost invisible to the eye, but do feel slightly different to the hand. Those in search of a less expensive variation might choose corrected leather. Corrected leathers are slightly lower quality in terms of regularity of grain and markings, and as such are slightly ‘exfoliated’ to remove the very top layer of the epidermis. They are then mechanically embossed with the grain pattern, before being treated with pigment and protective coating. These are sometimes still referred to as top grain leathers, although this term is somewhat inaccurate as some of the ‘top grain’ has in fact been removed. We use only 100% imported Italian leather for our “Deluxe” program. Colors include Bright White, Camel, Chocolate, Ivory, Black, Red and Saddle Tan. Semi-Aniline leathers are also colored by aniline dyes. As such they are also noted for their natural grain and softness. However semi-aniline leathers are treated with a clear sealant topcoat which has a slight sheen. This protective layer is thin enough that it does not obscure the grain, but serves to afford additional protection and color consistency. Semi-anilines are sometimes considered to be the best choice as they offer some degree of protection while still retaining the softness and natural character and beauty of the leather. We use only 100% imported Italian leather for our “Primo” program. Colors include Bordeaux, Cognac, Cappuccino, Golden Tan, Hunter Green, Black, Navy Blue, Parchment, Tangerine, and Wasabi. Aniline leathers are those top grain leathers colored solely by aniline dyes. Aniline dyes are used quite commonly, on all types of leather. These chromium based dies are heated to ensure better penetration into the leather, and to help the dye bond to the cellular structure of the hide. These transparent dyes preserve the subtle depth of translucence in the leather. Used without surface treatments of pigment and protective coating, aniline dyed leathers are the most natural and ‘naked’ and are therefore favored by leather lovers and purists the world over. No two aniline leathers are identical; each hide has its own characteristics. Aniline leathers are highly prized both for their luxurious softness and rich color. Because Aniline dyes do not coat the surface of the leather, they do leave it somewhat less protected than other dyes and treatments. Knoll uses untreated, top grain leather for its Barcelona Chairs. These hides are very high quality, having few natural imperfections, and as such can be used untreated, (without layers of pigment or clear coat protection). The difficulty with untreated leathers is that they fade easily, (more so than those with pigmented protective layers) and being quite porous they stain very easily. We use only 100% imported Italian leather for our “Exquisíte” program. Colors include Chocolate, Cranberry, Black, Tofee, White and Whiskey. All of our products are reproductions and are not licensed items. Instead they are inspired by by the designer. Gibraltar Furniture offers architectural office and home furniture at wholesale prices. 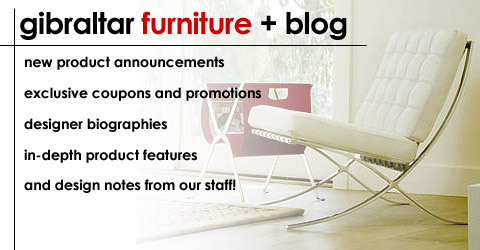 We feature discount major brand, world famous designer leather/metal/wood furnishings & seating factory direct to you! Toll free: 800-416-363. For the first time in history the entire collection is presented in its entirety directly from Spain. Moreover Gibraltar is the only source to present the entire catalog on the web for discount prices. And includes free shipping on all items. The collection consists of the Leda Low Table, the Leda armchair, Vis a Vis sofa, Barcelli Lamp, Muletas Lamp, Cajones Lamp, and the Rhinoceros door handle. These offical releases range from a low of $2, 073 for a Dali cast art piece door handle all the way up to to $28,853 for the Salvador Dali Vis à Vis Conversation Bench. We feel that a bit of art history knowledge is helpful in understanding and appreciating the art of Salvador Dali’s furniture. The multi-media artist was born in Figueras, Catalonia. He educated at the School of Fine Arts, located in Madrid Spain. After 1929 he espoused surrealism, although the leaders of the movement later denounced Dalí as overly commercial. Dalí’s paintings from this period depict dream imagery and everyday objects in unexpected forms, such as the famous limp watches in The Persistence of Memory. Dalí moved to the United States in 1940, where he remained until 1948. His later paintings, often on religious themes, are more classical in style. They include Crucifixion and The Sacrament of the Last Supper. Dalí’s paintings are characterized by meticulous draftsmanship and realistic detail, with brilliant colors heightened by transparent glazes. Dalí designed and produced surrealist films, illustrated books, handcrafted jewelry, and created theatrical sets and costumes. Among his writings are ballet scenarios and several books, including The Secret Life of Salvador Dalí (1942) and Diary of a Genius (1965). In addition to furniture Dali concentrated on accessories including lighting pieces. The Bracelli lamp is an archetypal design of Jean Michel and Dali, adopted by Dali for his house at Port Lligat. Originally designed in 1937 this piece is made out of Beech wood covered in fine gold leaf, and includes a supporting bracket in pale varnished beech. The lamp is crowned in a handmade cotton and rayon shade. The result is an angular almost unbalanced form, dreamlike and surreal. The reoccurring theme of the Muletas, or “crutch” appears here to restore order through frailty to the composition. Ironically, the appearance of crutches in Dali’s work can indicate a fragility of the human condition; here it seems to repair it. Ivory-colored cotton and rayon shade is hand made, 37 cm in diameter by 28 cm high. The lamp overall is an impressive 170 cm high. Gibraltar sells this remarkable unit for only $6000 and includes free shipping on this piece and every other unit in the collection. The Cajones Lamp is presented with buffed opal glass shades. Originally designed in 1937 this art piece sells for $2388. The carved structure is produced in pale varnished lime wood with feet of polished lacquered or chromed brass. Beige linen shade is handmade, 30cm in diameter by 30cm high. Lamp overall height is 67cm. It takes an E-27 100W spherical bulb. An interesting reoccurring theme we see in Dali’s paintings is that of the Muletas, or “crutches”. The appearance of crutches in Dali’s work can indicate a fragility of the human condition or other element which appears. The Muletas Lamp is presented with buffed opal glass shades. The carved structure is presented in pale varnished lime wood. Beige linen shade is handmade, 45 cm in diameter and 40cm high. Muletas Lamp overall height is 175cm. It uses an E-27 100W spherical bulb. Gibraltar Furniture is proud to offer the entire line of authentic licensed Dali line of high end pieces to collectors interested in certified pieces. All of our exclusive items are numbered, certified, and come with letters of authentication for the descriminating conosuire of fine art pieces.